"Bearing Comfort: Pat Bewley is spreading God's love one teddy bear at a time." By Sarah Asp Olson, in Thrivent Magazine Summer 2013, page 5. "This is witchcraft and idolatry!" My voice was louder than it should have been. As I read through it each sentence of the article was more and more ludicrous. then take them out to the sick and infirm. The bears are labeled with special words describing their powers. The teddy bears will then have the special powers to convey comfort, love, and especially God's love. Thanks to member Pat (Menges) Bewley's vision for spreading God's love and comfort through stuffed bears, more than 65 furry friends take part in Calvary's Sunday morning services each week – some even sit with the choir or go up with congregants for communion. At the end of services, members are invited to take the bears into the community and give them to friends, family members or strangers who may need a reminder of God's love. "None of our bears go out without first going through a church service," says Bewley. "On their little tag it says they've been loved by our congregation, and now they're coming to you with that love and the love of God." Calvary Evangelical Lutheran Church (ELCA) of Apollo Beach, Florida is the church. Really, though, one should not be surprised that superstition over a charm or modern relic has gained such a strong foothold in a supposedly Lutheran congregation. But we are required by God to warn His Church against these false teachings, regardless of how sincere and nicely intended the false teacher is. This kind of idolatry has a long history in the church, described in detail from the time of Elijah. This veneration of charms and works of the hands was the reason the Bronze Serpent was destroyed in the days of Hezekiah (2 Kings 18:4). It is certainly superstition, and it falls within the definitions of both the 1st and 2nd commandments as idolatry and witchcraft. you can easily see and judge how the world practices only false worship and idolatry. For no people has ever been so reprobate as not to institute and observe some divine worship; every one has set up as his special god whatever he looked to for blessings, help, and comfort. But someone might object, "Hey, Pastor Abrahamson, they didn't say they were worshipping the teddy bears, they just said that they were reminders of God's love." That is actually only part of what they said. And it is the partial truth that makes the lie even more appealing to those who promote and receive such magic charms or relics given in God's name. We do not have the authority to claim God is doing something where God has not explicitly told us He is doing something. That is why we can proclaim His grace and forgiveness in Baptism, the Absolution, and the Lord's Supper. But we cannot proclaim His grace through the recitation of the rosary, the veneration of Gabriel's wing feather, or passing on a teddy bear, medicine bag, or a rabbit's foot. 54] But, the greatest abuse occurs in spiritual matters, which pertain to the conscience, when false preachers rise up and offer their lying vanities as God's Word. The Thrivent article has the required heart rending testimonial about how well these little charms work in the life of a cancer survivor. Testimonials like this are a threat to those who would criticize. The threat is that if you speak against the practice you must be a hater. "How could you write or speak such hateful words against a woman who has benefited so greatly from these tokens of love?" Why? Because these tokens of love are a substitute gospel which is no gospel at all. They replace the love of Christ with a soft, fuzzy, non-specific inanimate charm that does not preach Christ crucified. Rather, the charm is an intentional way to avoid the real preaching of God's Word while pretending to proclaim God's love. "As I was recovering at a girlfriend's house, her neighbor brought me a teddy bear. I was in tears when I got that little bear from a gal that was practically a stranger. It was like God was there with me." The name of Christ appears nowhere in the article. His death and resurrection, the forgiveness of sins, sin, and the Word of God are not mentioned in the article anywhere. The The Lord's Supper is mentioned, but only as a magical place to which the teddy bears are taken as if it confers upon the teddy bears some divine power to comfort the ill or distressed. Faith is directed toward the teddy bears and the good intentions of those who formed this so-called ministry. So, we should all feel warm and fuzzy. Isn't this nice. They're doing something to make people feel better. They're taking teddy bears to church, and the teddy bears are taking God's love to the sick and infirm. I can just predict some of the comments. Biggest comment complaint would probably be: "Why do you have so much hate?" To those who think that I respond: Seriously? Is this what you think? You think that anyone and everyone who differs from you must therefore be a hater? You really need to rethink your life. You and your opinions are not the center of what defines love. God's Word, particularly the 10 Commandments and Christ's fulfillment of the Law are what define love. And it is particularly out of love for lost sinners that I wrote this criticism of the Thrivent article. It is not love to allow people to be directed to idols no matter how supposedly well intentioned this effort might be. Love considers the real consequences. Love listens to what God's Word actually says. Pointing people toward some kind of Christianized magic charm is nothing other than witchcraft in a sanctified disguise. There's something about wolves in sheep's clothing in book we're supposed to read. Thrivent, this is why I do not direct people to you as a "Christian" fraternal organization. You might have Christians as members of your financial group, but concern for them doesn't seem to keep your organization from caring about preventing such damning false doctrine as this article. Second biggest complaint in the comments might probably be that I'm daring to write against Thrivent, as if that should be a concern. But the fact is that I'm writing against the promotion of false doctrine by a group that claims to be Christian. And writing and speaking against this promotion of false doctrine is what I am required to do as a pastor. It won't matter what investments and insurance you have if you are directed by that organization to trust in magic charms rather than in Christ. There's something in that book we're supposed to read about bigger barns, and then taking life easy. If you really want to comment in a way that is significant, then direct your writing to Thrivent about their promotion of false doctrine in an effort to correct them. Making your reading of God's Word easier. Some people object to underlining, highlighting, or otherwise marking in the text of their Bibles. The purpose of this series of articles is to demonstrate some note taking methods and highlighting methods that can help in reading the Bible. The methods we will cover build upon the history of how the text of the Bible has been preserved for us to this day. This first article focuses on how writing text was done at the different points in history when the Scripture was given. This is not a historical-critical approach. What we will look at here is how writing using letters rather than ideograms or logograms made the Biblical text accessible to the everyday person. We will also look at how formatting the text developed to make reading even more accessible to readers. It is both fun and helpful to see how the original texts were preserved through the ages. Seeing how it was preserved can also help us learn how to build a note-taking and highlighting system that preserves the original text in its own context. As far as we know, we do not have any of the original manuscripts of the Scriptures. What we can do is look at how the Bible was likely to be written at the times God inspired the original writers. The alphabet used in modern Hebrew Bibles is the Imperial Aramaic alphabet which dates from the 5th century B.C. 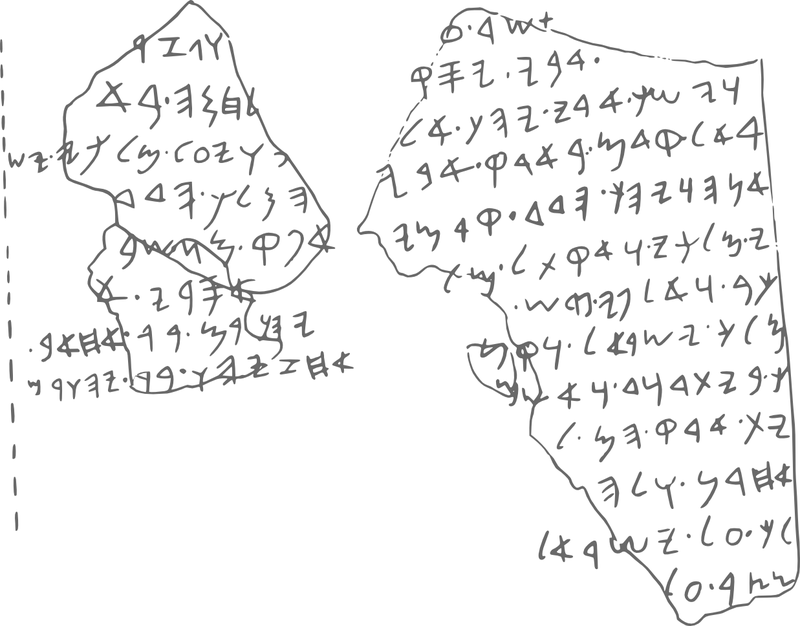 For a more thorough introduction to the writing systems of the Ancient Near East check out: Joseph Naveh, Early History of the Alphabet. 2nd ed, 1997. The two earliest texts in the Bible are the Books of Moses and, possibly, Job. We base our understanding of when Moses wrote his five books, the Pentateuch, on the dates given to us in Scripture. This puts the year of the Exodus at approximately 1,440 B.C. The Exodus took place over 40 years of wandering, during which Moses wrote down the books of Genesis, Exodus, Leviticus and Numbers. At the end of that wandering he recorded his final sermons to the people of Israel just before they entered the promised land. This is the book of Deuteronomy. The book of Job is a bit more difficult to date. Throughout the history of the Church different opinions have been offered about when this book was written. The earliest suggestions place the book back to the Patriarchal period, sometime around the period of Abraham. This could put the book of Job back at 2,000 B.C. or on down to much later. We will consider the earlier dates for the sake of demonstrating the ways in which Job's words might have been written down, carved in rock and filled with lead (19:23-24) or on clay or on leather. Cuneiform was a style of writing embraced by a wide variety of very different languages: Sumerian, Elamite, Hattic, Hurrian, Urartrian, Luwian, Hittite, Old Persian. It was also used for languages more closely related to Hebrew: Ugaritic, Eblaite, and Akkadian (Assyrian and Babylonian). The use of this style of writing ranges from the early styles at 3,300 BC down to the 1st century A.D.
Cuneiform means “wedge shaped, ” (Latin cuneus "wedge,"). The symbols and their uses varied from one linguistic group to the next, but the process was very similar: a stylus was used to press wedge or round shapes into soft clay. The clay then might be baked to make the writing permanent. Many cuneiform systems consisted of logograms (symbols which represent a word in a language) and a syllabary (symbols which represent a combination of a consonant and the following vowel sound). Some of the symbols functioned both as a logogram and as a syllable, depending on context. Some of the syllable signs could act as more than one different combination of consonant and vowel, depending upon context. In this text there are no divisions or spaces between words, there is no punctuation, there are no paragraphs, or other types of markers to help the reader read the text. The result of transcription is that a person only needed to know 22 letters in the Paleo-Hebrew alphabet in order to read a text. This compares to having to learn somewhere between 200 and 400 symbols in order to read the Akkadian cuneiform symbols. The city-state of Ugarit developed a 31 symbol system using cuneiform characters but limited to specific consonantal sounds like that of the Phoenician or Paleo-Hebrew alphabets. It also incorporated a new feature, a special mark to divide between words. 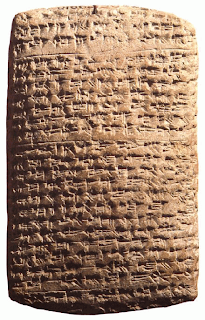 Ugarit used this “alphabetical cuneiform” from the 14th century B.C. until the city's destruction in the 12th century B.C. From this we can understand that if the book of Job were originally written in Akkadian cuneiform or Ugaritic cuneiform there would have been no problem accurately transcribing the text from either possible source scripts in the Paleo-Hebrew script. In fact, transliterating the texts from cuneiform to Paleo-Hebrew would have greatly eased the learning of reading and writing by reducing complexity, length of leaning, and would have the added value of increasing the types of material usable for continued preservation of the text from one generation to the next. These alphabets referred to by the term “abjad”—a shorthand for an alphabet system made up of consonantal symbols but not vowels. 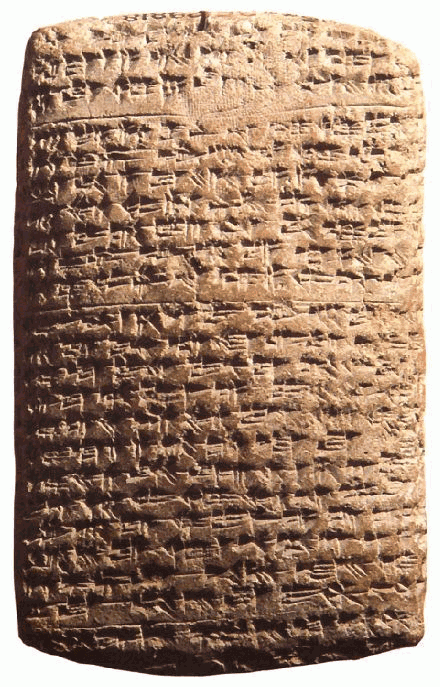 If Job was written sometime between 1,700-1,200 B.C. 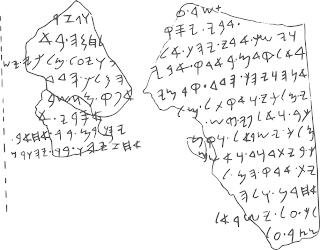 the book could have been written in the Proto-Sinaitic Script, also called Proto-Canaanite. This alphabet consisted of about 30 symbols. 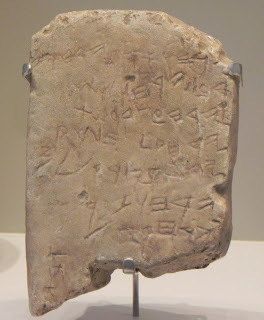 What is interesting to me about the historical development of this script is that the examples we have are contemporary with when the Bible describes the exile of Israel to Egypt for 430 years. 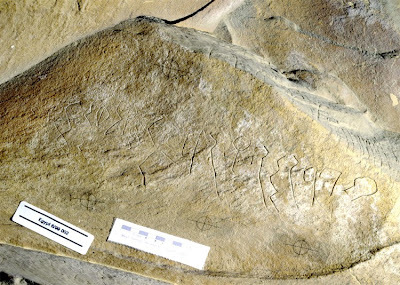 There are not very many Proto-Sinaitic inscriptions found as of yet. Most of the inscriptions are found in the Sinai, Middle-Egypt, a copper mine at Timna in southern Israel, and a very few found in the Canaan region itself. The inscriptions vary from being possible instructional signs at the Timna mines to what appears to be a religious expression, possibly pagan, at Wadi el-Hol (between Thebes and Abydos at Qena bend of the Nile). Some of the symbols were probably used as logograms, like abbreviations: for example, the letter M was the symbol of water, the name for the letter was the word for “water” and would make a very suitable short-hand easily understood on the lid of a water jar. It is impossible to say whether or not this type of writing would have been used for the book of Job. We just don't have enough surviving examples to know if it were used for literary texts. 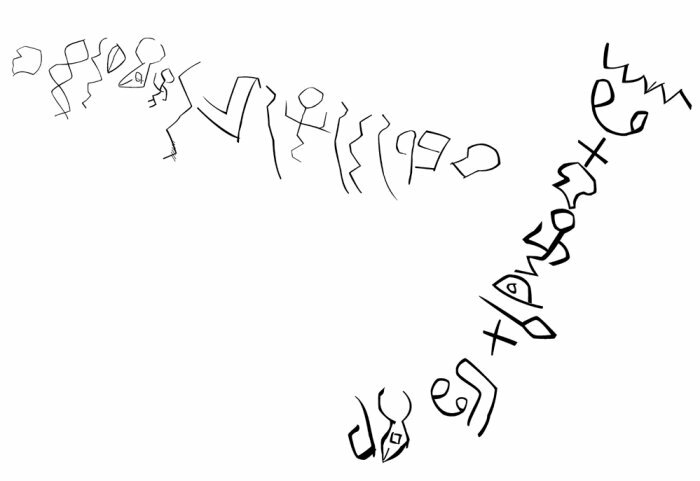 However, the symbols and their use are very close to that of Paleo-Hebrew characters, all the letters of the Hebrew language appear to have an equivalent in this Proto-Sinaitic/Proto-Canaanite script. And quite a few of those letters have the same basic shapes. 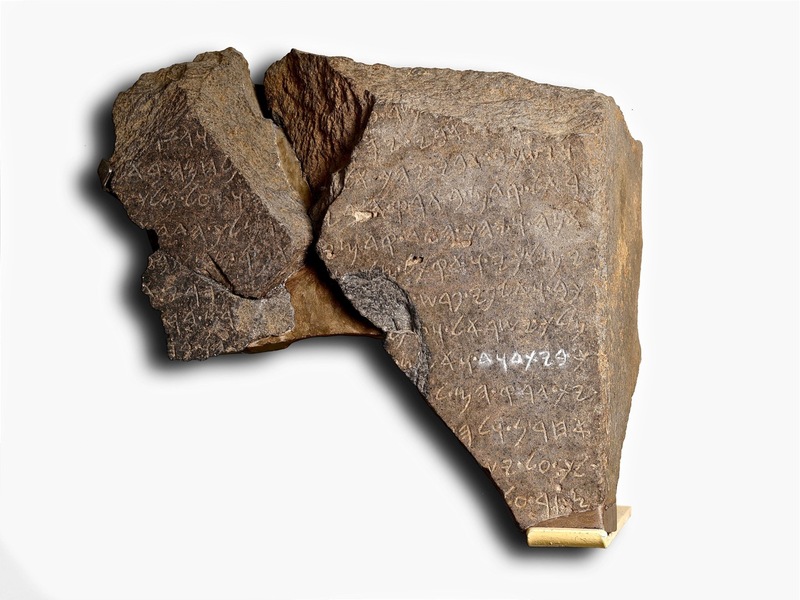 This script was in use throughout Canaan and the surrounding area for many Semitic languages from about 1,200 B.C. down to 137 A.D. It was in common use for inscriptions, letters, notes, lists, seals, jewelry, and epigrams. It was not limited to a scribal class. 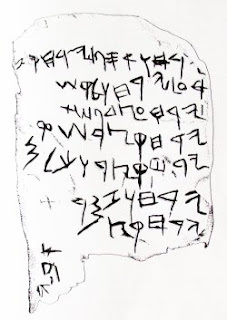 We have examples of Bible texts written in this script from at least as early as the 7th century BC. The features of each inscription give us examples of how writing was done in those times. This teaches us both about the preservation of the Biblical text as well as the ways in which the use and formatting of language changed to make the reading of the text easier and more accessible through the generations. Our first two examples come from the 10th and 9th centuries B.C. The Gezer Calendar inscription is a small (about 5 1/2 inches by 2.5 inch by 5/8 inch thick) inscribed limestone block discovered at Gezer by by R.A.S. Macalister in 1908. Gezer was one of the few ancient cities that actually had its name written on rocks at its city limits. That's how we can be reasonably certain that the rock comes from this Biblical city. The archaeological context of the rock is a bit vague because Macalistar worked in a time when dating by soil layers (Soil Stratigraphy) hadn't been discovered yet. Readers might recognize the shapes of some of our letters in this inscription. P and W and Z kind of stand out, even though the P is backwards and is actually equivalent to our "R". The W is actually pronounced "sh." And the funny Z with the extra vertical stroke on the left is pronounced something like "ts." The O doesn't have an equivalent in English but is something akin to choking on steak and trying to say the the letter G. The Y stands for the sound we make with W. The circle split down the middle to look like a backward P attached to a P is the letter Q. The little triangle is the letter D. The letter that looks like a sideways M with an extra leg is an M. The letter that looks like H with a bar at the top and bottom is pronounced "ch" like when you showed your mom something gross and she said "Ach! Put that away!" You get the idea. Early History of the Alphabet. And there are no vowels written down: just consonants. Here is a transliteration of what it might have sounded like and then a translation. And the vertical writing at the bottom left: "Abiy." (2) ing. There are two months of planting. (3) There is a month of cutting flax. (4) There is a month of harvesting barley. (5) There is a month of harvest and finishing. (6) There are two months of vinedressing. (7) There is a month of summer fruit. And the vertical writing might by a name: "Abi" or "my Dad", or it could have been "Abijah" if the final letter is missing. Hebrew was written even for farming. Thus as a written language the Hebrew text of the Bible was not inaccessible due to any conjectured social limitations modern scholars might project back upon ancient Israel. No vowels were used--not even a mater lectionis (more below). This means, in part, that the people who read it were familiar with the text and how to read it out loud. Ths s nt s hrd s y mght thnk. There were no spaces between words. Bttdsmplythtthywrsklldrdrs. Words were broken from one line to the next. All the letters are of the same case. That is, there is no distinction between upper-case and lower-case letters. THTSSMWHTHRDRTRD. 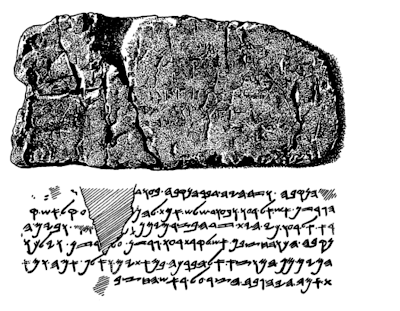 The Tel Dan Inscription comes from the site of Tel Dan in Northern Israel. It was discovered during the 1993-94 excavation season. It is an Aramaic inscription (closely related to Hebrew, parts of the Bible are in Aramaic). 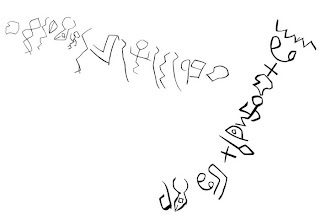 The inscription shows some ways in which writing improved so that it was easier to learn and to read. The highlighted text in the picture above are the letters BTDWD which translate as "House of David." This is the earliest known reference to King David outside the Bible. And the reference is hotly contested because so much scholarship today has been geared at undermining trust that David even existed as a person. The inscription has noticable dots between words. These are word dividers. Similar word dividers can be seen in the Mesha Stele, a Moabite inscription from the East side of the Jordan that dates to about 850 B.C. 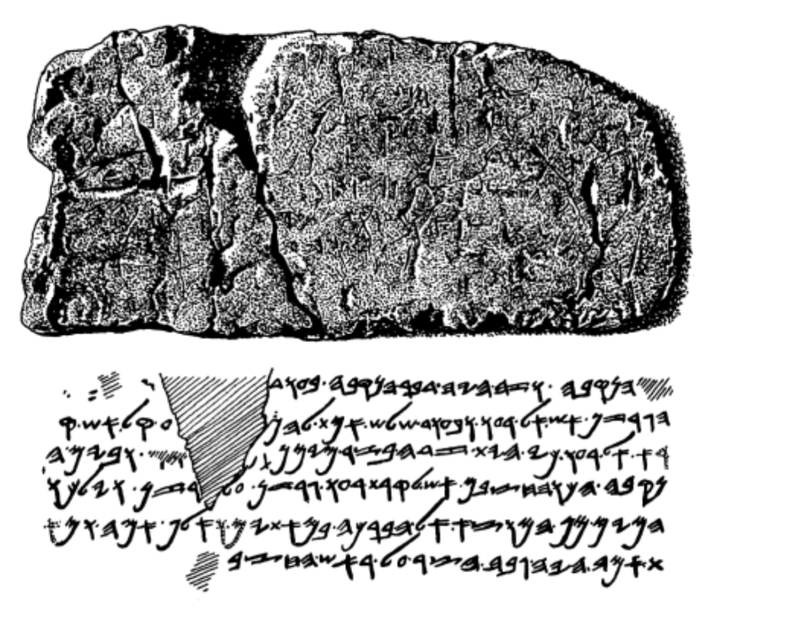 The Moabite Stele describes Jehoram's alliance with Jehoshaphat against king Mesha of Moab (2 Kings 3:4-8), but from Mesha's royal perspective. More is recorded in 2 Chronicles 32:3-4. “And he took counsel with his officers and his mighty men to stop up the waters of the fountains that were outside the city, and they assisted him. And a large multitude gathered and stopped up all the fountains and the stream that flowed in the midst of the land, saying, "Why should the kings of Assyria come and find much water?"" water from the source to the pool for 1200 cubits. and 100? Beside the interesting historical information about Hezekiah's tunnel, and giving us some everyday history, this inscription with the others listed show us how the text of the Bible had been recorded to make reading the text easier. The word dividers are a very significant improvement. However, using a sign like the dot in these inscriptions, means that words can still be split. This leaves one or more letters on one line and the rest of the letters of a word on the next. In the next article we will look at some of the developments in writing we can learn from the Ketef Hinnom Inscriptions, the Mousaieffe Inscriptions, the Lachish Letters, and then from the Dead Sea Scrolls. After that we will look at what we can learn from Greek Manuscripts and Inscriptions of the New Testament. I see your tired face. I know that this morning while trying to brush your teeth your kid knocked over your coffee. I know that finding clean socks for everyone can sometimes be embarrassingly difficult. I know that staying home seems like it would be better sometimes. I’d say sleeping in sounds better, but let’s be real, sleeping in is a thing of the past. I know that when you are at church sometimes it feels like your child is the only one who can’t seem to sit and be quiet. And that depending on your congregation, they may be the only little voice in the building. I know it can feel like trying to contain a small brigade of animals keeping your kids in the pew. I know that there are whole services you haven’t heard because you were doing damage control or pacing the back or running that new member of the potty training club to the bathroom again. I want to tell you something. Maybe you hear it all the time, maybe you never hear it – bringing your children to church is the right thing to do. It’s the right thing to do when they are cooperative and it is the right thing to do when they aren’t. The NIV, A problem with adopting a temporary solution. Should a congregation, synod, or denomination adopt a translation that is only intended to be in circulation for 10 to 15 years? The New International Version, a translation produced by Biblica is intended by its editors and translators to be updated for the sake of modernizing the language in just such a span of time. The first full NIV translation of the Bible was published in 1978. This translation was revised and published in 1984. A new NIV was in the works with plans to publish in 1997. But that translation failed because the Church did not accept the theology of this translation in large part due to its use of inclusive language. 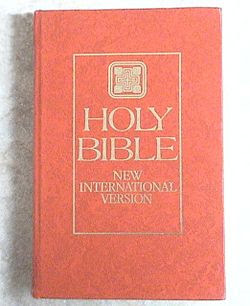 The 1997 edition was revised and released in 2002 with the full Bible published in 2005 as Today's New International Version. This version also failed to meet the approval of the Church due to theological problems also stemming in large part from the use of inclusive language. In 2009 Biblica began revising the TNIV, changing the name back to The New International Version and adding the year of publication: NIV 2011. This revision still has much of the inclusive language of the previous versions but also incorporated other changes to the text. The practice at Biblica has been to make the old versions disappear. That means one can no longer purchase a 1978 or 1984 version, nor can one access these versions online. If it had not been for the resistance of the Church to the version of 1997 the older 1984 edition would have disappeared by 2001 due to Biblica's publication policy. This means that the intended maximum lifetime use of the 1984 edition was 15 years. If a congregation or synod chooses to adopt a translation that is intended to change so rapidly it faces the problem of theological review of the new versions. This is time consuming--and expensive because of the time. Choosing such a temporary translation also means great expense in many other areas. Pew Bibles, confirmation books, catechisms, hymnals, liturgical books, Christian Day School curricula, and any other publications based on the old version have to be edited and re-published to fit the new version. This period of editing and re-publishing can take 5 years or more. Which means that the useful life of those books is cut down to between 5 and 10 years. Perhaps this is good business for the publishers. But it is a terrible practice for a congregation. Grandparents who had memorized passages for Christmas, Easter, and confirmation class face the problem of having the words of Scripture changed on them. They no longer are able to speak the same truths in the same words as their children or grandchildren. They are even made to stumble over the words used in their weekly worship which were meant to become part of them like breathing itself. This post is not meant to be an argument against making a better translation. What I intend is that congregations be aware of some of the ways they are setting themselves up for unnecessary problems and expense by not taking into account the publication cycle of a transitory Bible like the NIV. I would like to suggest that stability in translation from one generation to the following generations is more edifying to the families, congregations, and the Church in general. I believe this has been demonstrated both from a spiritual and theological perspective (as exampled by the theological failures of so many revisions of the NIV) as well as from a simple economic perspective. The economic considerations are also worthy of considering in a time when many congregations find it difficult to pay for maintaining their church and their servant of the Word.